Small 'bush' planes make a huge difference to those living in remote areas. They bring people, mail and provisions on a daily basis - weather permitting. Snow machines have replaced the husky teams, but can break down. As the elders warn, " A dog can find his way home, but no eat sno go if lost and hungry. " Skiffs are use in the short summer months for travel on the river. 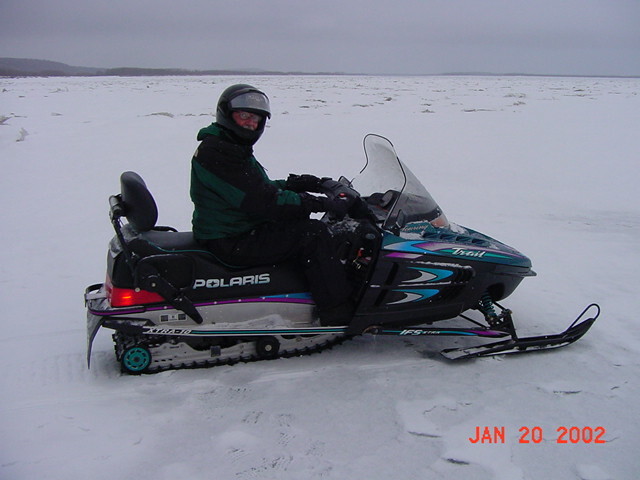 The snow machine or sno go is popular for the winter trips and a chance to explore further from the village. SNOW MACHINES: Snow machines often pull sleds of children to school in the winter months. Older students arrive on their own. Many of the adults love to go out exploring when the trails are firm enough. 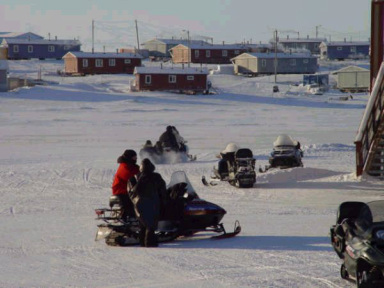 GPS units have made traveling by snow machines less hazardous, although weather and some locations may limit the ability of the unit to connect to satellites. Four-wheelers are great for summer trips to the post office. But digging them out after a heavy snowfall, is not as much fun. Cargo leaves little room for passengers. Villagers heading out to a neighbouring village. For many Alaskans, flying to larger cities for shopping and errands is as common as city dwellers using taxis and buses. However there are many hazards in flying in bush Alaska, such as quickly changing weather patterns and long distances between fueling stops. A welcome sight in My Alaska, the bush plane.